Sheriff never made a music video to promote it. It was a song that was a staple of junior high dances in the early ‘80s. Not one went by that we all wanted to dance close with a girl to that slow, romantic ballad. It disappeared only to reappear near the end of the decade and, inexplicably after the band who recorded it had broken up, go all the way to number one on the Billboard Hot 100. Such is the strange journey to the top for “When I’m With You” by the Canadian band Sheriff. 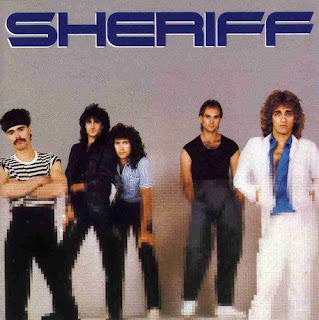 Sheriff released their self-titled debut album in 1983 when I was in Grade 8. “When I’m With You”, this touching, crooning ballad was the third single to be released. It would go all the way to number eight in Canada. It also charted in the United States, peaking at 61. Back then we had regular junior high dances, and “When I’m With You” was part of the soundtrack of life, with other Canadian songs such as “Innocence” by Harlequin, “The Kid is Hot Tonight” by Loverboy, “Your Daddy Don’t Know” by Toronto, and “Straight From the Heart” by Bryan Adams. It was one of the slow songs we all wanted to dance to, hopefully with the girl of our dreams. That would be Sheriff’s biggest hit, and only album. They broke up in the mid 1980s. By Grade 11, so the spring of 1986, “When I’m With You” was still on the radio, kept alive by Canadian content requirements. I was writing this play that was based on my own time in Grade 11 in high school. I was really intent on using music in it as well, and I had pretty much set the songs I wanted to use by then. I always had this dream that my play would make it big. One of the songs, in a pivotal school dance scene in the play, was “When I’m With You” by Sheriff. At the time it had had some brief success in Canada, but was largely unknown anywhere else. I thought it would be cool if my play hit it big and introduced the world to “When I’m With You” at the same time. Well, my dream came half true. In the most bizarre of coincidences, a Minnesota program director somehow discovered “When I’m With You” and started playing it in 1988. It rocketed up the charts and went to number one on Feb. 4, 1989, two weeks exactly before my 19th birthday. By then, Sheriff had broken up long ago and declined to reunite. That may be one of the strangest one-hit wonders of the decade. “When I’m With You” was a special song to me. Still when I hear it, I think of school dances and slow songs. After I decided to include it in my play, I would have a blank tape ready to record it, if I ever heard it on the radio. The album was not in any record store I looked, nor any garage sale I visited, so taping it off the radio was my only choice. Eventually, I did get a crisp, clear recording off LA-107 FM Lethbridge late one night. It also still amazes me that my dream half came true. That song was discovered and appreciated for how good it really was. Sheriff had broken up, with some members forming “Frozen Ghost” and others forming “Alias”. They both would have success with their own songs. Oddly, Frozen Ghost released a song called, “Dream Come True”. Mine sure did, thanks to them.